Maple-cured, coho salmon drizzled with sweet-tangy red cedar emulsion. Summertime baked apricot tart. Award-winning wines. These are the things top-rated restaurant dreams are made of -- not necessarily what you expect to find on a train. But Rocky Mountaineer, where you'll dine on these and other delicacies, isn't just any train. Along with a journey through breathtaking forests, majestic mountains and sparkling waterfronts, the luxury coaches take you on a culinary journey with elegant fine dining and creative cuisine based on the flavors of Western Canada. "Our office is the train. We are inspired by the scenery that we can see and smell as we travel," says Jean Pierre Guerin, Rocky Mountaineer's executive chef. In the premium GoldLeaf Service, guests enjoy panoramic views from the upper level of a luxurious bi-level, glass-domed coach, then walk downstairs for a three-course dining experience. The room has the feel of an exclusive restaurant: crisp white linens, fine silver, freshly cut flowers and, just out of view, a custom professional stainless steel kitchen. But here, unlike in a typical restaurant, large picture windows provide ever-changing, incredible sights. 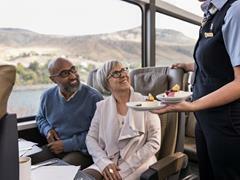 Meanwhile, in the SilverLeaf coaches, passengers enjoy custom dishes from the comfort of their seats, where they can focus fully on the ride and scenery with every bite. Special touches like mobile salad bars and a variety of gourmet desserts put the personalized service in a class by itself. (Warm brownies smothered in chocolate sauce and berries, anyone?) 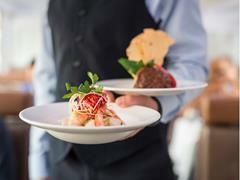 Each meal is custom-plated to the passenger's preference and to suit any appetite. And, similar to GoldLeaf Service, gourmet snacks and drinks are available on demand. 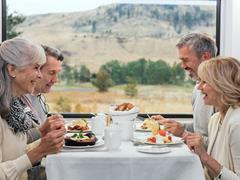 Rocky Mountaineer is the perfect setting in which to explore local flavors while being immersed in the beauty and history of the passing locales that produced them. "All the food reflects the regions and is truly Western Canadian. We also source our food locally when possible — from Alberta beef to British Columbia potatoes," Guerin says. "We want the culinary adventure to be as authentic as possible." And it is, from the moment you climb aboard and smell freshly baked cinnamon scones until you tuck into a dinner of sea salt-flecked Fraser Valley chicken or braised Alberta beef short ribs. Between meals, you snack on Earl Grey-scented trail mix, freshly baked cookies and gourmet cheese. Wines from British Columbia's Okanagan Valley and local craft beers and other complimentary beverages round out the culinary experience. That experience doesn't have to end with your trip. The cookbook "Eat Play Love: Regionally Inspired Cuisine by Rocky Mountaineer" helps you recreate favorites at home, such as the pork tenderloin and fluffy whole wheat and buttermilk pancakes. "The book features our most popular and timeless gourmet menu items," Guerin says. "It offers a second opportunity to enjoy a favorite meal from the journey and relive the memories. It offers a chance for guests to bring their experience to life by sharing their stories with friends and family while enjoying a dish from the journey." Shaping the culinary excellence of the Rocky Mountaineer are two acclaimed executive chefs, both experienced culinary stars from France currently based in Vancouver. Award-winning Guerin, who's known for fusion cuisine, began his career at five-star hotels and restaurants in France, Canada and the Caribbean. He opened one of Vancouver's finest restaurants, Five Sails, in the Pan Pacific Hotel, and served as corporate chef for Lufthansa Sky Chefs, where he redesigned first-class menus for a host of prestigious airlines -- useful training for his current task of delighting the appetites in Rocky Mountaineer's premier environment. His compatriot, Frédéric Couton, specializes in innovative menu creations and artistic execution. Born in the French Alps, Couton trained in Michelin-starred restaurants and perfected his craft in the kitchens of fine Hilton hotels in Paris, Geneva, Montreal and Bangkok. He's won several major awards in culinary competitions and has been executive chef at the British Columbia Club and the Cannery Seafood House, a Vancouver institution. Together, the duo creates magic in the Rocky Mountaineer's mobile kitchen. "Organization and teamwork is key," says Guerin. "Within our small space, everything has its place. It's important to work quickly and neatly; we work together like a symphony." 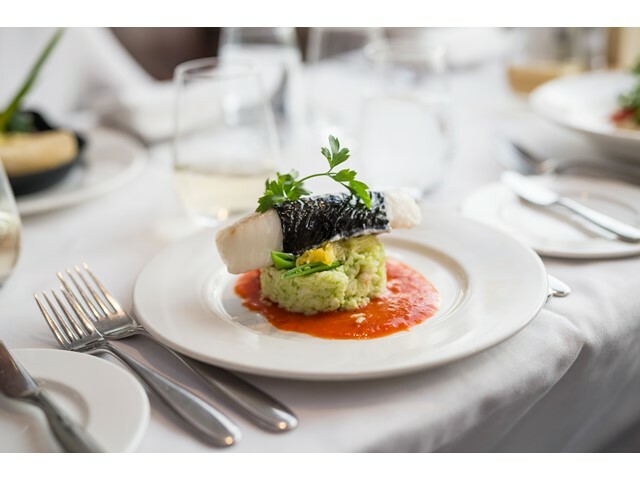 And, after each season, the executive chefs reimagine the outcome of that symphony, creating a new menu with an eye to the current bounty of the regions, improving classic dishes and creating entirely new offerings. All the more reason to book a second trip.